Welcome to the Academy of Notre Dame de Namur. 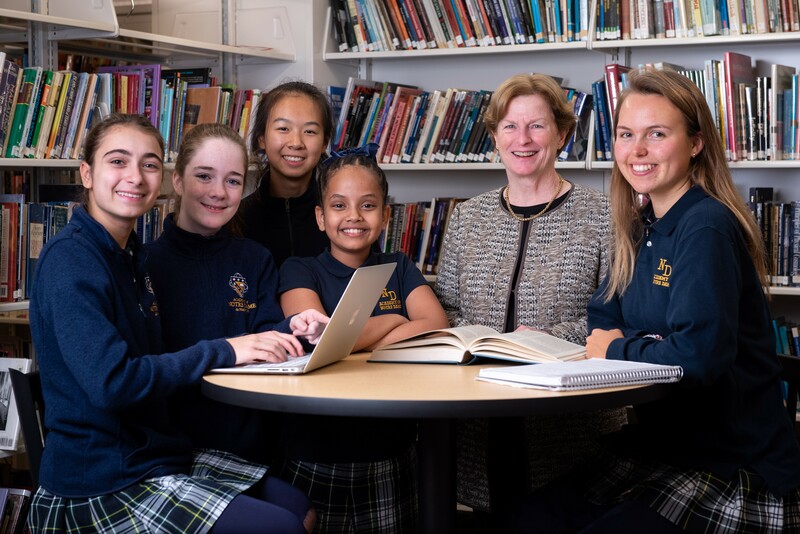 Since 1856, our school has inspired young women to inquire, explore, imagine and innovate. Notre Dame believes that moral values shape great leadership. As a community of faith, we celebrate our Catholic mission and the pioneering legacy of the Sisters of Notre Dame de Namur. We teach our students “what they need to know for life” in an atmosphere of community and service. Notre Dame fosters a robust, high quality, college preparatory environment that is student centered, enabling every young woman to develop her gifts and talents by offering a range of interdisciplinary curricular and co-curricular activities in an atmosphere of affirmation. We recognize that we prepare our students for opportunities and challenges in careers that may not yet exist. To that end, Notre Dame promotes the core competencies that provide a solid foundation for a successful future in this digital economy, both at the university level and beyond. These competencies include the ability to think and analyze in an integrated fashion, to understand the dynamic of theory and practice in all disciplines, to collaborate and frequently lead a project, to integrate technology in a responsible way and to communicate effectively. We encourage our students to envision themselves as global citizens. The Academy is also a safe harbor for our young women, especially during these critically important formative years. Helping students confront the unknown, address complexity, handle stress and learn from their mistakes or failures provides an environment that educates the whole student — spiritually, emotionally, socially and intellectually. We believe that such a climate promotes integrity, self-respect and self-conﬁdence. We encourage you to visit our campus. You will discover a vibrant educational community that demonstrates that the intellectual journey never reaches a set destiny; there is always the next student or faculty member to ask, “What if?” That is the privilege —and the fun.